This beautifully written account explains how the pranayama of “bee breath” is used in one hospital. “Despite feeling dizzy, you listen to [the] teacher’s instructions and you bring your fingers to touch your sense organs. Thumbs gently press on your ears on both sides, index fingers cover the eyes. As you block your vision, you are momentarily confused as to what to do next. The teacher gently grabs your middle fingers and brings them to the sides of your nose, he guides your ring fingers to the space just above your lips and your small fingers just under. He calls this gesture the yoni mudra and the practice of attentive breathing—bhramari. Read the full post to learn why this particular type of breathwork may be helpful for mental health. 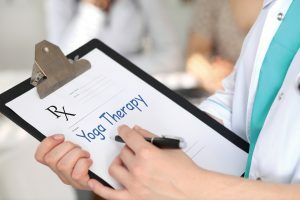 And from Yoga Therapy Today magazine, read about a few ways training programs for yoga therapists are being conducted in clinic and hospital settings. Thank you for sharing the innovative work being done at the Mahatma Gandhi Medical College and Research Institute Hospital by the Centre for Yoga Therapy, Education and Research of the Sri Balaji Vidyapeeth in Pondicherry, India.